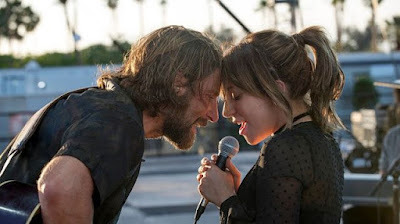 The story of A Star is Born is a classic Hollywood fable that has been retold several times and never fails to charm its audiences. It concerns the romantic relationship between two people headed in different directions – an eager young woman who seeks to make a name for herself in the media and an established male star whose career has already crested. One is on the way up, and the other will soon be headed down. A Star Is Born (2018), directed by Bradley Cooper and starring Lady Gaga and Bradley Cooper. The subject of this review is the last of this classic tale’s four reincarnations – it has been a huge hit, both with critics and at the box office, and it is likely to secure several Oscar nominations [1,2,3,4]. Its popularity is undoubtedly enhanced on this occasion by the fact that for this film the cultural medium of interest in the story is popular music. 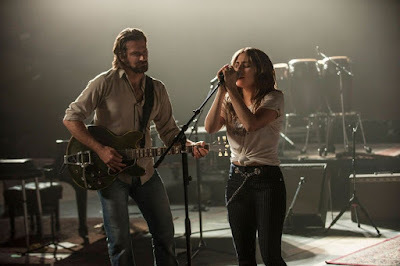 And the film’s major virtue is its renderings of pop songs sung by Lady Gaga and Bradley Cooper. In particular, Lady Gaga (Stefani Joanne Angelina Germanotta), who is known for her provocative, over-the-top performances, is here in her first starring role very realistic and under control. It is her emotive and convincing performance, both on the musical stage and off, that is the key to the film’s success. Bradley Cooper, who is a well-known actor here directing his first film, is also convincing and effective as the established but troubled country/rock star Jackson Maine who is attracted to the up-and-coming singer Ally played by Lady Gaga. However, despite the film’s musical virtues, there are some deficiencies in other areas that detract from one’s overall enjoyment. Note that we might expect a film of this nature to have a dual narrative focus – one narrative thread concentrating on the external, professional aspects of the two singers and another thread of relatively equal weight devoted to the dynamics of their personal relationship. However, here in this film, though those two narrative threads exist, the balance between the two is very unequal, and most of the screen time is devoted to the relationship thread. We only learn about what is going on in the external thread from incidental material provided in the relationship thread. This gives the film a more intensely emotional flavour throughout. 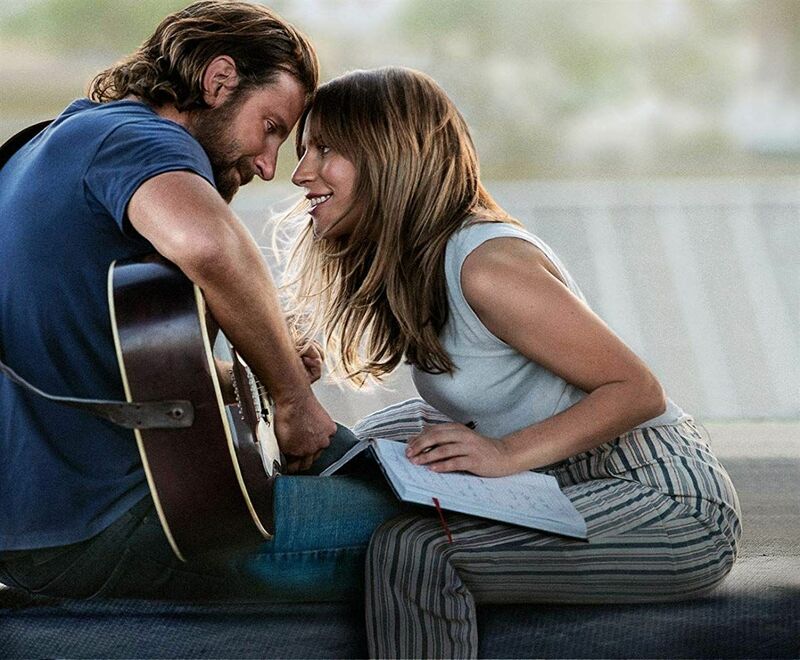 We might see the story of A Star is Born as passing through four stages characterizing the dynamics of the romantic relationship between the two singers. In the beginning Jackson (“Jack”) Maine (played by Bradley Cooper) is shown performing before a massive and adoring audience. Afterwards he goes out looking for a place to have a drink and winds up wandering into a bar that is having its drag queen performance night. Among those singing songs there is a young woman Ally Campana (Lady Gaga), who is not gay but is allowed to perform there if she dons drag-queen makeup. When Jack hears Ally’s dramatic rendition of “La Vie en Rose”, he is stunned by her talent and seeks to get to know her. He invites to come to his next show, and when she comes backstage, he invites her out on stage to sing with him before his audience. Afterwards, he invites her to join him on his next tour. Ally is thrilled to be with such a famous star. On the tour, Jack encourages Ally to sing her own compositions, which he sees come from her heart. Soon Ally is drawing attention on her own as a talented country singer. Also during this period, the relationship between Ally and Jack flowers, and they become a romantic couple. But we also see that Jack is a serious alcoholic and drug addict. Much of the time he is shown staggering around in an inebriated state. Because she adores Jack, Ally puts up with his drunken phases, but she is increasingly alarmed. As Ally’s singing attracts more and more attention, she draws the interest of a record producer, Rez (Rafi Gavron), who offers her a recording contract but wants to shift her focus away from country music to glam electro-pop. Jack reluctantly accepts this development but fears Ally will be moving away from singing songs from her heart. And this, along with Jack’s increasing and now almost constant drunkenness, signal troublesome developments in their relationship. However and despite some quarrels, the repentant Jack proposes marriage to Ally, and she enthusiastically accepts. With Ally’s career now ascendant and Jack’s in decline, though, tension between the two of them increases, and there are more quarrels about Ally’s new career direction. But Ally’s professional act under the direction of Rez continues to attract fans, and she is nominated for a Grammy Award. At the Grammy Awards ceremony, Ally wins the prize for Best New Artist. But when she goes up onstage to accept the award, Jack drunkenly follows her up there, too, and makes a fool of himself before passing out. The seriousness of Jack’s addiction problems is now evident to everyone, even to Jack, and he disappears into a drug rehabilitation program for a couple of months. Upon Jack’s release and with his firm avowal to stay sober, Ally decides to spend more time with him to ensure his recovery. She invites him to perform with her on her upcoming European tour in the hopes of renewing their old good times. However, Rez rejects such a prospect, and so Ally decides to cancel her tour so that she can be with Jack. Subsequently Rez privately berates Jack for damaging Ally’s career, and this makes Jack so depressed that he quietly goes off and takes his own life. Ally is crushed by Jack’s suicide, but ultimately decides to continue her singing. At a tribute concert for Jack at the film’s close, she sings a song of his, “I’ll Never Love Again”, that he had written for her but had never performed. 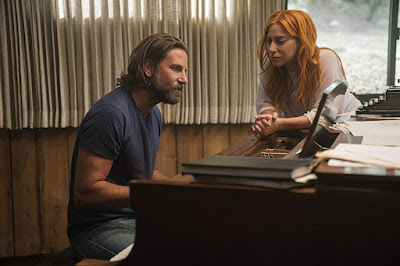 So this story of A Star is Born is carried by the excellent musical numbers performed, sometimes separately and sometimes together, by Lady Gaga and Bradley Cooper. It should be noted, though, that for the most part these musical numbers do not reflect or underscore the film’s narrative content, the way the songs do in most dramatic musicals. They just come along, one by one, as pleasing pieces of entertainment. Note, though, that apart from the enjoyable music, there are other aspects of the film that come up short. The most egregious deficiency is the shaky hand-held camerawork that is employed throughout the film. This image shakiness was clearly intended, because it was used even in static closeups, and this was presumably done to evoke an intense, personal atmosphere. But its use here is excessive and only serves to distract the viewer. Another annoyance is the often mumbly and indistinctly articulated dialogue on the part of Bradley Cooper and Sam Elliott (who plays Jackson Maine’s older brother, Bobby). Both Cooper and Elliott affect Southern accents in the film, and it is often hard to hear what they are saying during their mumbling. Robert Altman could get away with this kind of thing in certain contexts, but it doesn’t work for Cooper here. A third problem in the film concerns the nonstop depiction of Jack’s drunkenness. It seems almost as if Cooper, as Jack, staggers his way through much of the film in a near drunken stupor. After awhile this becomes wearing, and it severely diminishes any potential for developing a vital romantic chemistry between Cooper and Lady Gaga. But the film does have some essential virtues that help to compensate for the above-mentioned deficiencies. One is the songs sung very effectively by Cooper and Lady Gaga. These are almost uniformly appealing. Another and most important virtue is the dramatic performance of Lady Gaga, herself. Both onstage and off, she comes across as an authentically passionate and moving character who sustains the viewer’s interest. It is her performance that ultimately makes A Star is Born a worthwhile viewing experience. 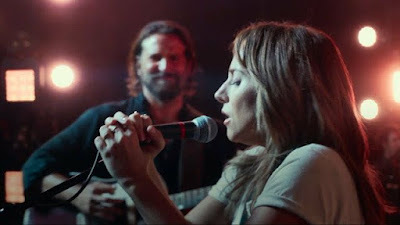 Manohla Dargis, “Review: ‘A Star Is Born’ Brings Gorgeous Heartbreak”, The New York Times, (3 October 2018). Tanmay Shukla, “'A Star is Born' Review: A tragically beautiful and exhilarating remake of the classic musical”, A Potpourri of Vestiges, (2 October 2018). 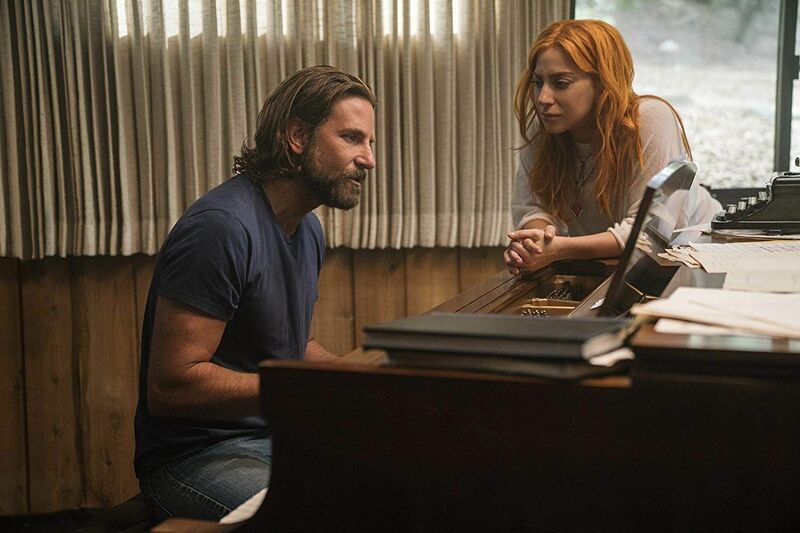 Kenneth Turan, “Review: Bradley Cooper sings, Lady Gaga acts, and their version of 'A Star Is Born' is a total knockout”, Los Angeles Times, (2 October 2018). Paul O’Callaghan, “Venice first look: A Star Is Born revives a Hollywood tale for the YouTube age”, Sight & Sound, (4 September 2018). 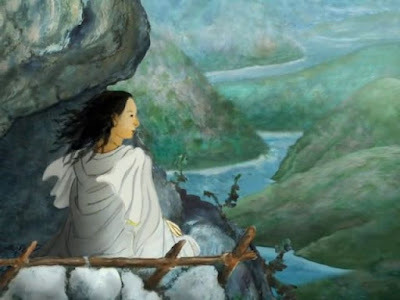 Rabindranath Tagore’s famous novella Nastanirh (The Broken Nest, 1901 ) was the basis for the 9th and 10th episodes of the recent anthology television series Stories by Rabindranath Tagore (2015). This series was created by and under the general directorship of Anurag Basu, and these two episodes covering Tagore’s story were directed by Anurag Basu’s wife, Tani Basu. 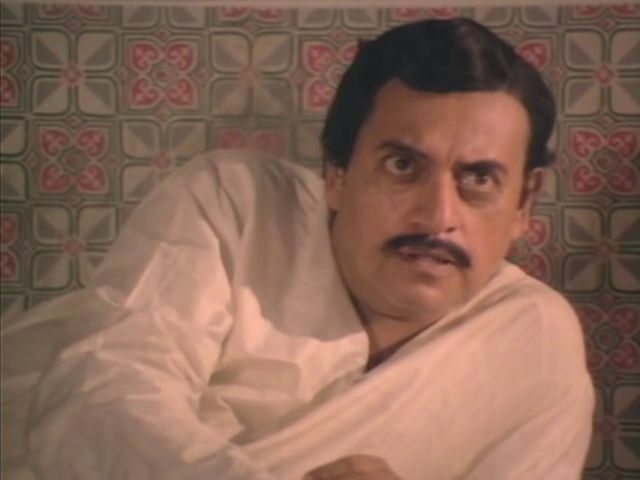 Tagore’s Nastanirh concerns what happens in an upper-class Bengali household when the neglected young wife of a workaholic newspaper editor develops an unsettlingly close relationship with her husband’s younger male cousin. Tagore’s subtle portrayal shows a cultured family trying to come to grips with a potentially disruptive situation. A related aspect that has always fascinated Tagore followers is that this kind of familial situation seems to have mirrored Tagore’s own personal experiences. When he was growing up, Rabindranath Tagore was friendly with his older brother Jyotirindranath’s young wife, Kadambari Devi. Similar to the age distribution of the principal characters in Nastanirh, Rabindranath was twelve years younger than Jyotirindranath but almost the same age as his sister-in-law. With more free time available to them, Rabindranath and Kadambari Devi spent a lot of time together and became close companions, with common interests in poetry and art. However, shortly after Rabindranath had an arranged marriage at the age of 23, Kadambari Devi committed suicide, and it has always been assumed that her close relationship with Rabindranath may have figured into this tragic event. I will not comment further about this other than to suggest that the feelings evoked in Tagore’s Nastanirh were probably very close to his heart. It is not surprising then that Tagore’s delicate story about this situation has been filmed on several earlier occasions – the most notable of these being Satyajit Ray’s masterful rendition, Charulata (The Lonely Wife, 1964). 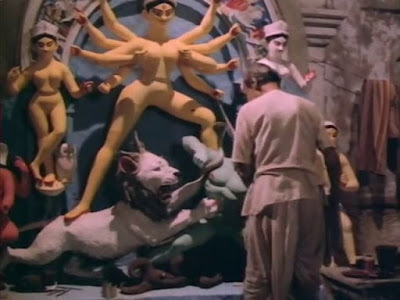 All things considered, both Ray’s film and Tani Basu’s TV production are relatively faithful presentations of Tagore’s Nastanirh, and both are excellent. But they differ somewhat with respect to what they emphasize, and so I will make some comparisons between the two productions in what follows. In this connection I invite the reader to consult my review of Ray’s Charulata, which I will occasionally refer to below . Note that there is an idiosyncratic aspect of the Stories by Rabindranath Tagore that must be brought to your attention in case you just want to see this story in the series. The individual Tagore stories were written over a fifty-year period, but they are linked together in this series, which is set sometime in the 1930s, so that at the tail end of one story, there is a lead-in to the next story. In many cases this lead-in material offers significant information for the succeeding story that should not be missed. This happens to be the case with the story of The Broken Nest, where important lead-in material is provided in the last eight minutes of the preceding story, “Punishment”, Episode 8 of the series. 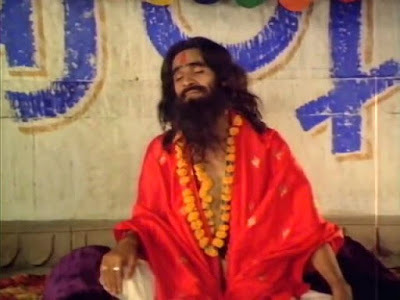 Bhupati Babu (played by Kranti Prakash Jha) is a thirty-something upper-class Bengali and is the editor/publisher of a new progressive newspaper. He is obsessively concerned about the success of his new newspaper, into which he has poured all the resources of his family estate. 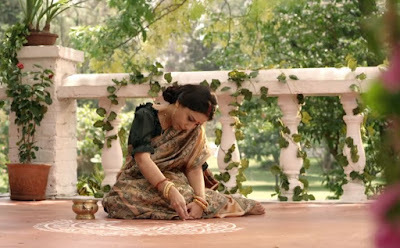 Charulata (Amrita Puri) is Bhupati’s beautiful and culturally aspiring young wife. Amol is Bhupati’s younger brother in this version of Tagore’s tale. In Tagore’s original story and in Ray’s film, Amol was Bhupati’s cousin. However, this distinction between brother and cousin seems not to be significant in these circumstances, since in accordance with Bengali family practice, cousins were often treated like brothers, and they called each other “brother”. Amol is about a decade younger than Bhupati and comes to visit his “brother’s” household after finishing his undergraduate studies. Umapada is Charulata’s older brother. Although he is thus Bhupati’s brother-in-law, again family custom leads Bhupati and Umapada to call each other “brother”. Manda is Umapada’s young and relatively banal wife. Because Bhupati is continually preoccupied with his work, Charulata is left unattended and is bored with her life. In an effort to provide his wife with some companionship that might make things more interesting for her, he has invited his brother-in-law, Umapada, and his wife, Manda to come live with them at their family estate. At the outset of the story, shown in the last eight minutes of Episode 8 of this series, Charulata (aka Charu) is shown to be neglected and lonely in her sumptuous family estate. Her husband Bhupati is busy at work all the time preparing for the inaugural issue of his new newspaper. Although he has invited her brother Umapada and his wife Manda to come live with them, their presence hasn’t provided any stimulating company for Charu. In hopes of finding something interesting to do with her time, Charu tells her husband that she wants to learn singing. At the beginning of Episode 9, Amol comes to stay in the Babu household. We immediately see the contrast between the two “brothers”, Amol and Bhupati. While Bhupati is a gentle and thoughtful introvert, Amol is a loud and self-absorbed extrovert who wants to attract all attention to himself. Though Amol is ostensibly engaged in the study of law, his real passion is for singing. Upon seeing this, Bhupati asks Amol to teach singing to Charu. Soon Charu and the viewer are regaled by songs sung by Amol. And their growing affinity gradually becomes evident. When Bhupati receives an attractive marriage offer for Amol (from a good family with a generous offer to finance his future legal studies), Amol flatly rejects the offer. He can’t bear to abandon the carefree life he is now leading. Meanwhile we see that Bhupati has engaged “brother” Umapada to look after the business side of his fledgling newspaper so that he can concentrate his time on editorial matters. Much of this 9th episode, though, is devoted to presenting Amol’s singing, and this lends a decidedly lyrical feeling to this first-half of the story. This musical tone of the story is in fact a key feature of this telling of Tagore’s story. 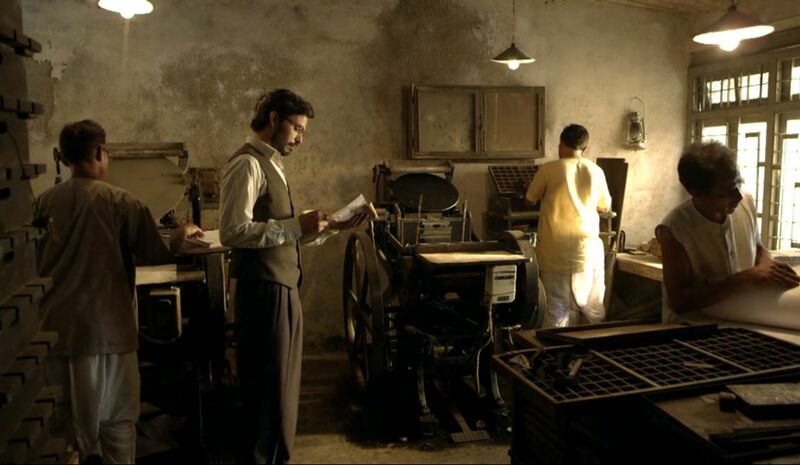 Note that in Tagore’s original story, as well as in Ray’s film, The Lonely Wife, Amol and Charulata engage each other by composing and reciting poetry. So there is a resulting contrast between the logical and analytical world of Bhupati’s prose and the more free-flowing and emotive poetic world of Amol and Charulata. But it is still bounded by the limitations of text. Here in The Broken Nest, by contrast, the distinction between Bhupati and Amol is more profound – it is that between the mechanical formulations of text and the visceral feelings of music. And in my view that is a significant virtue and advantage of this work. A further advantage here is the way these songs are presented visually, with evocative and well-edited closeups giving expressive color to the songs that are sung. As their singing sessions continue, Charu unconsciously becomes more and more attracted to the brash and handsome Amol. One day she hears Amol singing one of their songs on national radio. For Amol, this is a proud moment, but Charu takes offence that a song she had taken to be composed for her, alone, had been made into a public commodity. So she goes ahead and composes her own song. But when she sits down at the piano and plays it for Bhupati, she is perturbed to see that her over-worked husband has fallen asleep. In the 10th episode the ramifications of the previous developments come to a head. First Charu sings her own composition to Amol, and he is impressed with and charmed by her own musical abilities. But then a disaster strikes the household. They learn that Umapada has all along failed to pay Bhupati’s business creditors and has now made off with all of the money that Bhupati had entrusted to him. Bhupati is financially ruined, and his newspaper must be shut down. All his hard work has come to nothing. However, Bhupati confides to Amol that the biggest hurt came from being betrayed by someone close to him and whom he had trusted. But he says he can keep going as long as he has Charu by his side. Amol listens to this lament and realizes that his growing relationship with Charu represents a potentially even greater betrayal of Bhupati’s trust. So when Bhupati receives another marriage proposal for Amol, the now silently self-reproving young man quickly accepts the offer. Charu is immediately distraught at the prospect of losing her cherished friend. When they have a chance to be alone, she begs Amol to decline the proposal, and she tearfully embraces him in desperation. But Amol is adamant. Honor ultimately triumphs over love in this situation, and he departs. The scene now shifts to two months later, and Bhupati has been hesitantly sharing with Charu his nascent attempts at writing poetry. But Charu is still obsessed with the absent Amol and is trying to exchange telegrams with him. In the closing scene, when Bhupati finally realizes that Charu has a hitherto concealed passion for Amol, he breaks down in tears and disconsolately burns all the poetry he had written for Charu. Then he departs from his broken nest. 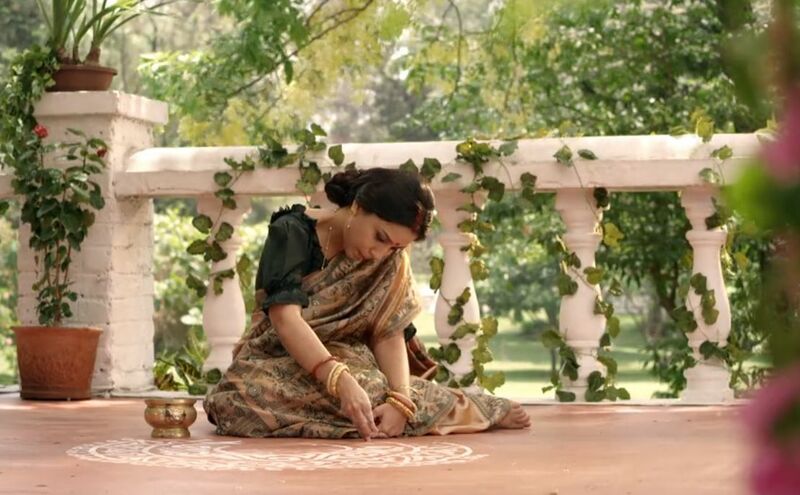 This tension between the aesthetic and ethical modes of existence is more clearly articulated and balanced in Ray’s Charulata than it is in Basu’s The Broken Nest. Here in The Broken Nest the emphasis is very much tilted toward the aesthetic side. Indeed in this version of Tagore’s story, Bhupati’s Brahmo-Samaj-inspired political progressivism (i.e. his external ethical concern) is downplayed, and he is shown to have his own aesthetic sensibilities (his poetry), too. 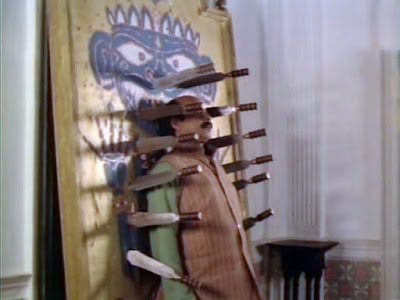 So the ethical vs. aesthetic divide is less clear-cut in this treatment as compared to Ray’s Charulata. Thus with respect to this underlying philosophical theme of the aesthetic vs. the ethical, I would say that Ray’s film is the more successful presentation. Nevertheless, Basu’s The Broken Nest has its undeniable virtues. The episodes encompassing this story are permeated with a melodic quality that enhances the feelings about what this tale is about. Besides the many songs that are explicitly sung, the background music is, despite its often intrusive character, a further instrument supporting this story’s overall musical temper. Note also that given the blurring of the aesthetic vs. the ethical opposition here in The Broken Nest, we might say that the duality under concern here is not so much the ethical vs. the aesthetic as it is the related pair of the textual vs. the musical. Bhupati here in this presentation is a man of text. He supervises rationally-based textual discourse for his newspaper; and when he is away from the paper, he writes poetry. In contrast, Amol is a man of soulful music. He sings what is in his heart. Moreover, in this version as compared to Ray’s film, the Bhupati character is more sympathetically portrayed, while the Amol character is more self-centered and egotistical – he is less Charu’s soul-mate here. That slight shift in character portrayal in this version renders the musical/passion side of the presented duality more mindless and instinctive – which makes Charu’s ambivalent feelings more profound to her innermost being and therefore more tragic. Overall and despite some occasional uneven elements, I think Basu’s The Broken Nest is an excellent work. 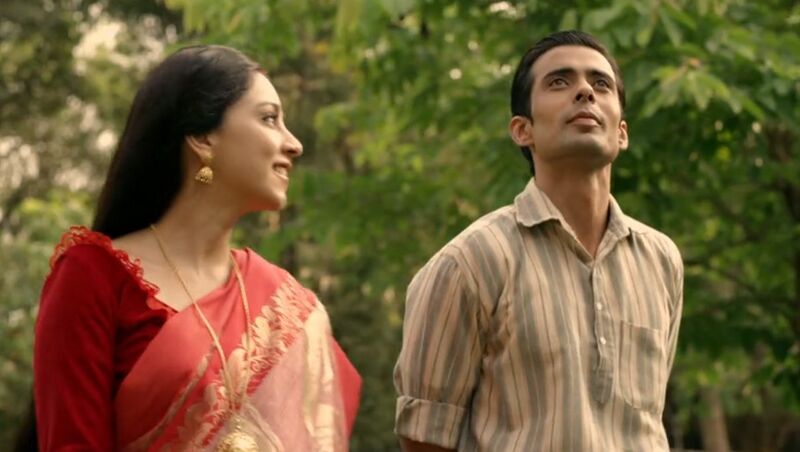 It is particularly buoyed by the well-crafted and lyrical songs that are presentedd, along with the moving performances by Kranti Prakash Jha (as Bhupati Babu) and Amrita Puri (Charulata). Rabindranath Tagore, Broken Nest and Other Stories, (Sharmistha Mohanty, trans. ), Westland Limited, (1901/2009). 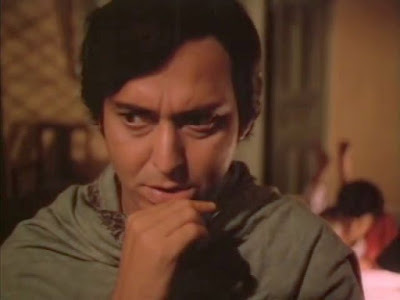 The Film Sufi, “‘Charulata’ - Satyajit Ray (1964)”, The Film Sufi, (30 November 2013). 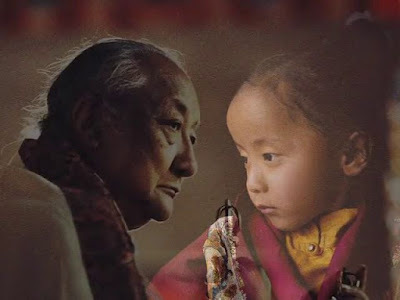 Dilgo Khyentse Rinpoche (1910-1991), one of the most revered Tibetan (Himalayan) Buddhist lamas of the 20th century, is the subject of the documentary film Brilliant Moon: Glimpses of Dilgo Khyentse Rinpoche (2010). The film is a professional and well-crafted biography of Dilgo Khyentse Rinpoche, who was a master of the Vajrayana tradition of Tibetan Buddhism and an outstanding scholar, poet, and teacher. He was, like the Dalai Lama, one of the few masters to be bestowed the honorific “His Holiness”, and he eventually rose to become the head of the Nyingma school, which is the oldest of the four main schools of Himalayan Buddhism . One of the interesting features of this film is the degree to which Tibetan and Himalayan Buddhist lamas and dedicated practitioners were key contributors to its production. The film was directed and co-scripted by Neten Chokling, aka the Fourth Neten Chokling Rinpoche (note that ‘Rinpoche’ is an honorific in the Tibetan language and is not a surname). Chokling is, besides being a filmmaker (cf. Milarepa, 2006), an important lama from Bhutan who was officially recognized at an early age as the reincarnation of an eminent earlier Buddhist lama [2,3,4]. Chokling’s filmmaking skills were honed by working with another lama/filmmaker, Khyentse Norbu (aka Dzongsar Jamyang Khyentse Rinpoche), on the latter’s films The Cup (1999) and Travelers and Magicians (2003). 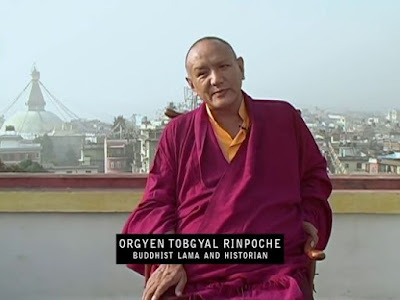 In addition, one of Neten Chokling’s Buddhist teachers was Orgyen Topgyal Rinpoche, who is another important Himalayan Buddhist lama and filmmaker (cf. his The Life of Milarepa ) and who happens to be (by religious certification that he is a reincarnation of an earlier family member) another major lama in the Neten Chokling Rinpoche family line. Both Khyentse Norbu and Orgyen Tobgyal were disciples of Dilgo Khyentse Rinpoche, and they appear here in Brilliant Moon and reminisce about their beloved master’s unmatchable virtues. 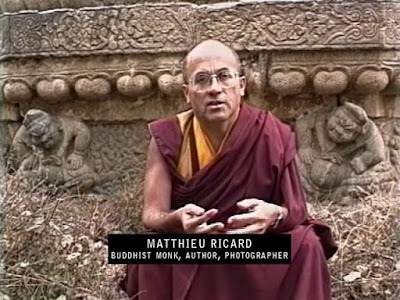 One of Brilliant Moon’s cinematographers (along with Vivian Kurz) was Matthieu Ricard, a Frenchman who after completing his Ph.D. in molecular genetics, converted to Himalayan Buddhism and adopted the life of a Buddhist monk, becoming a close student of Dilgo Khyentse Rinpoche and an assistant to the Dalai Lama. He has, nevertheless, continued his activities as well-known writer, photographer, and filmmaker (in 1995 Ricard directed his own documentary about Dilgo Khyentse Rinpoche, Journey to Enlightenment). Moreover, as a result of a famous MRI brain-scan study conducted by the University of Wisconsin’s Laboratory for Affective Neuroscience, he has since been accorded the popular designation as the “world’s happiest person” [6,7,8]. The film producer of Brilliant Moon was the lama Shechen Rabjam Rinpoche, who is Dilgo Khyentse Rinpoche’s grandson and who is now the abbot of the Shechen Monastery in Nepal, which is one of the six primary or "mother" monasteries of the Nyingma tradition of Tibetan Buddhism. Brilliant Moon is narrated by two well-known figures of American popular culture, the actor Richard Gere and the singer Lou Reed. Both Gere and Reed embraced Tibetan Buddhism years ago, and Gere, in particular, has been a frequent visitor of the Dalai Lama and a public advocate of Tibetan independence. However, despite the potential pop-culture fanfare opportunities of having Gere (cf., for example, Chicago, 2002) and Reed (the lead singer of The Velvet Underground, cf. “Walk on the Wild Side”, 1970) onboard, their participation is not hyped in this film, and their names only appear modestly in the credits. Brilliant Moon’s account of the life of Dilgo Khyentse Rinpoche is presented more or less linearly in ten named chapters. In the early phases of his life, for which there is basically no historical photographic evidence, Chokling presents things vividly by using animated images. This works well and confers a fabular feeling to the presentation that befits the legendary lama. Dilgo Khyentse Rinpoche was born in 1910 in Denhok Valley in the Kham region of Eastern Tibet. As a young boy, he suffered a serious injury by stumbling into a cauldron of boiling soup and was bedridden and depressed for months. At this point the melancholy boy decided to enter the monastic life, and his health gradually improved. At the age of 14, he went to study at the Shechen monastery, one of the six principal monasteries of the Nyingma school of Himalayan Buddhism. 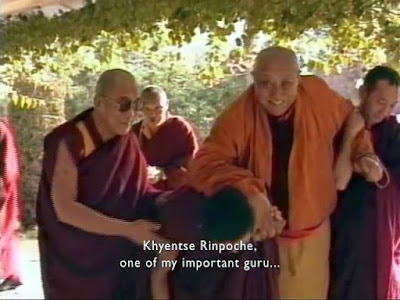 There he came under the tutelage of Shechen Gyaltsaab Rinpoche, a famous lama who passed onto him many sacred teachings before Gyaltsaab passed away 2 years later. Then at the age of 15, Dilgo Khyentse entered into a long meditation retreat, hiding away alone in caves in Eastern Tibet for the next thirteen years and constantly meditating and carrying out ritual practices. 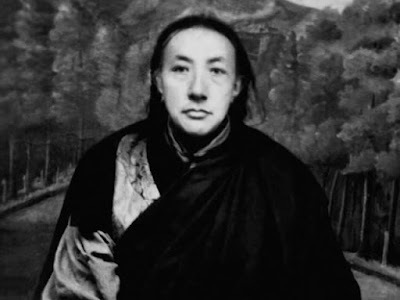 At 28 Dilgo Khyentse Rinpoche came out of his meditation hermitage and more directly under the tutelage of his spiritual lama master, Dzongsar Khyentse Chokyi Lodro. Though Dilgo Khyentse wanted to continue his life in solitary meditation, Khyentse Chokyi Lodro urged the young man to go out into the world and spread the teachings he had learned to others. So Dilgo Khyentse began traveling about Tibet and spreading his spiritual message. However, the gradual takeover of Tibet by the People’s Republic of China beginning in 1950, which led to the 1959 Tibetan uprising, caused severe disturbances in Tibetan life. So in 1959, like the Dalai Lama had done earlier in the same year, Dilgo Khyentse had to flee Tibet. After a long and dangerous trip, he found refuge in Bhutan. As a refugee, Dilgo Khyentse was welcomed by the king and royal family of Bhutan. Dilgo Khyentse had two daughters, the younger of whom died while studying in India during this period. 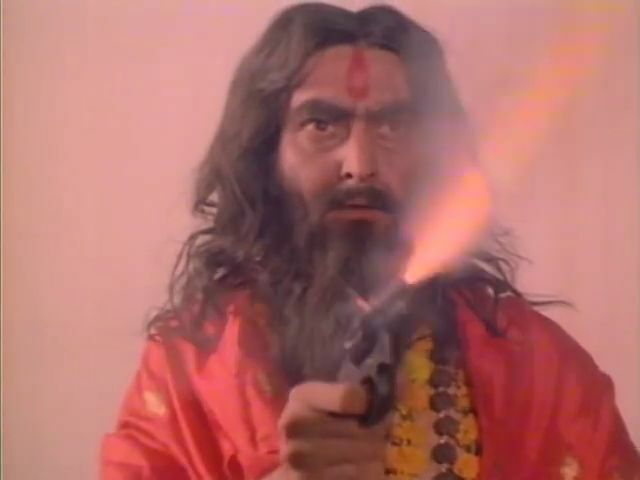 His older daughter gave birth in 1967 to a son, Shechen Rabjam, who is the producer of this film. Over the years, Dilgo Khyentse had over sixty masters from the four main schools of Himalayan Buddhism give him instruction on the sacred teachings. As a result, he adopted a nonsectarian perspective that, through his own teachings, helped to unify the Himalayan Buddhist community. He then went on to spread these teachings across the wide region and gave instruction to many existing and future masters. For example, the Dalai Lama regarded Dilgo Khyentse as his principal teacher of the Nyingma tradition and of the Dzogchen tradition. And in 1980 he founded the Shechen Tennyi Dargyeling Monastery in Nepal. In 1985 with the ruling Chinese authorities having relaxed their restrictions on visiting Tibet, Dilgo Khyentse was able to return to his homeland. There he continued his work on restoring devastated monasteries. Finally, after Dudjom Rinpoche’s death in 1987, Dilgo Khyentse Rinpoche became the head of the Nyingma School of Tibetan Buddhism. But even as an old man, he tirelessly continued his holy work until his death in 1991. By that time his writings had amounted to more than 10,000 pages. He was also involved in the preservation and publication of more then 300 volumes of sacred Buddhist texts. After Dilgo Khyentse Rinpoche’s death and following Himalayan Buddhist tradition, there was a search for his religiously certified reincarnation. In due course a young boy born in 1993 was identified as such and given the name Dilgo Khyentse Yangsi Rinpoche. Dilgo Khyentse Rinpoche first traveled to Europe and the US in the 1970s, and he made some more trips thereafter. These visits helped spread his holy teachings to a Western audience. 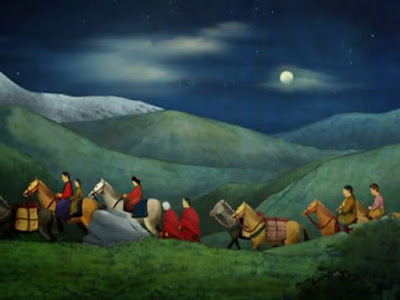 Overall, Brilliant Moon: Glimpses of Dilgo Khyentse Rinpoche is a well-crafted work, with the excellent mixture of smoothly-edited archival material that is combined with the aforementioned atmospheric animation work covering the master’s early years. I also liked the music composed by Joel Diamond. But I particularly liked the inclusion on the soundtrack of Mia Doi Todd’s moody song “River of Life/The Yes Song”. Those are tones that resonate in my memory whenever I think of this fine film. His Holiness the Dalai Lama is effectively the head of another of the four schools – the Gelug school. Orgyen Tobgyal Rinpoche, “The Neten Chokling incarnation line”, Rangjung Yeshe Publications, (1983). “Neten Chokling”, Wikipedia, (10 March 2018). “Neten Chokling Rinpoche”, The Rigpa Shedra Wiki, (28 March 2018). Orgyen Topgyal Rinpoche, “MILAREPA part 1 - 'How I met Marpa'”, Youtube, (26 September 2015). Orgyen Topgyal Rinpoche, “MILAREPA part 2 - 'The Ordeals'”, Youtube, (14 September 2012). 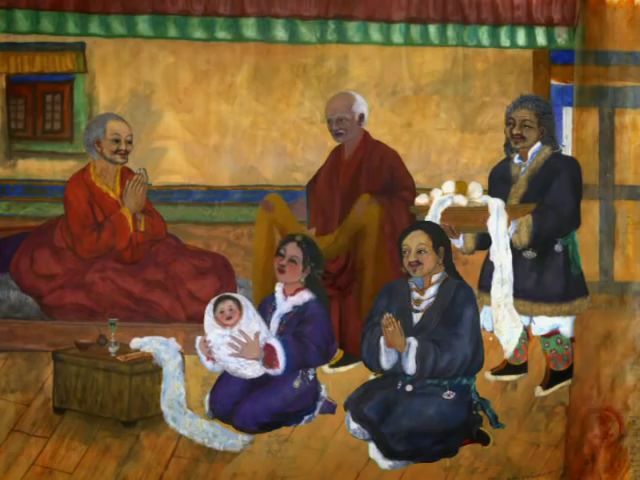 Orgyen Topgyal Rinpoche, “MILAREPA part 3 - 'Initiations and Instructions'", Youtube, (22 December 2012). Orgyen Topgyal Rinpoche, “MILAREPA part 4 - 'Mila leaves Marpa'", Youtube, (12 February 2013). Orgyen Topgyal Rinpoche, “MILAREPA part 5 - 'Detachment'", Youtube, (22 May 2013). Orgyen Topgyal Rinpoche, “MILAREPA part 6 - 'Illumination'", Youtube, (6 January 2014). Orgyen Topgyal Rinpoche, “MILAREPA part 7 - 'Samsara" (remastered version)'”, Youtube, (21 May 2014). Orgyen Topgyal Rinpoche, “MILAREPA part 8 - 'The Demons'", Youtube, (18 January 2015). Orgyen Topgyal Rinpoche, “Milarepa part 8 Epilogue - 'Retreats'", Youtube, (21 September 2016). Alyson Shontell, “A 69-year-old monk who scientists call the 'world's happiest man' says the secret to being happy takes just 15 minutes per day”, Business Insider Australia (25 December 2016). Robert Chalmers, “Matthieu Ricard: Meet Mr Happy”, The Independent, (18 February 2007). Matthieu Ricard, Happiness: A Guide to Developing Life's Most Important Skill, Little, Brown and Company, (2007).